Stoves Richmond and Sterling range cookers have always enjoyed a great reputation, and the latest versions (launched late 2018) have been completely re-engineered to make them even better. Now available in standard “core” and Deluxe guises, we take a closer look at these lovely new range cookers from a highly regarded brand. The old adage “If it ain’t broke, don’t fix it” is usually a reliable one, and in the case of the highly successful and still hugely popular Stoves Richmond and Sterling ranges there has never been much wrong with the way they look and feel - Richmond’s beautifully balanced traditional elegance and Sterling’s sharp glass-fronted contemporary edge are still highly desirable. Engineering-wise, though, things move on and there comes a time when there is a case for improving and evolving the production processes and the underlying integrity of the platform, as well as refining some of the features. 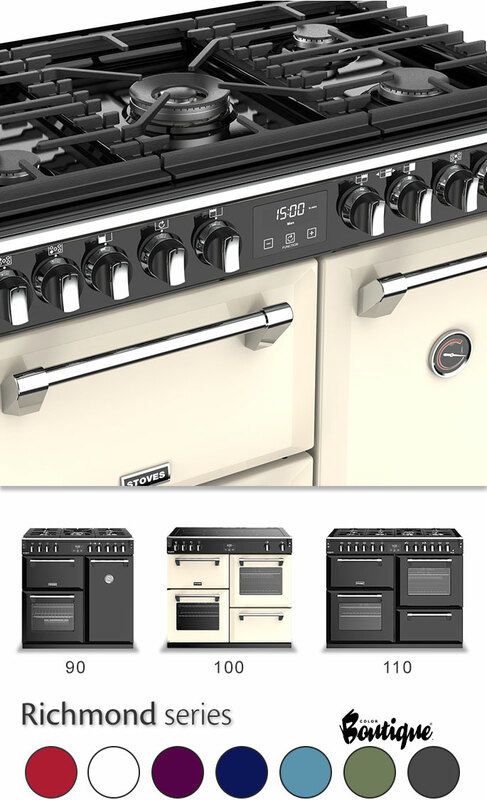 Stoves’ strategy in relaunching their range cooker collection was also to elevate the products to a position in the market more directly comparable to their main competitor, the prolific and well-renowned Rangemaster. In truth, the popular Stoves ranges always were a very real alternative to this arch rival, but these reworked 2018 models really do take them on head-to-head, with prices very much in-line and a somewhat fuller feature-list. The justifiably elevated prices also put more distance between Stoves and their budget-friendly sister-brand Belling, produced to the same high standards in the same factory in Merseyside, a reminder that these cookers are very much Made in Britain. The impressive build quality is very evident, and is the same whether you choose the core model or the more feature-laden Deluxe. A sturdy feel and solid-feeling door closures have always been a Stoves characteristic, but this is even better now. 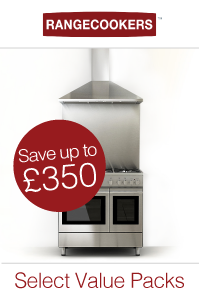 The platform has been redesigned from the ground up, with a premium one-piece Unicast frame giving excellent stability and strength, and although the look is the same there are improvements to all areas, including gas hobs with revised PanGlide pan supports and increased power, heavy-duty oven shelving, improved and telescopic Pro-Trac shelf runners, full-width grill and oven pans, a pizza function in the main oven, and a clear and easy-to-use touch control MaxiClock timer. There are even some very nice gas-thru-glass models which give you a great looking and easy-to-clean ceramic hotplate combined with gas burners offering even more power. 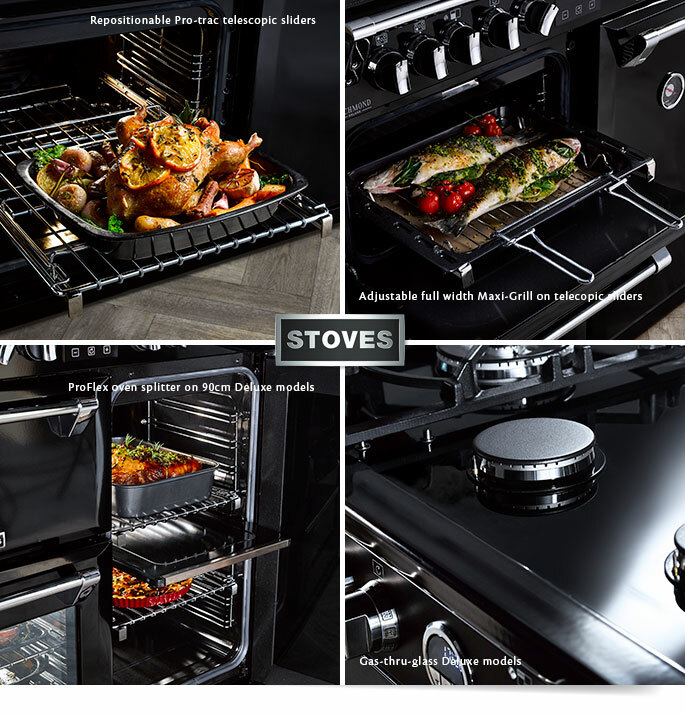 Sterling now includes a conventional oven in the grill cavity (as does the Richmond), and in response to customer feedback Sterling 90 models now have a see-through glass door on the tall oven. Similarly, Richmond models now come in a paler and much preferred Classic Cream. All Stoves products come with an excellent warranty, of course - 5 years parts and (when purchased through Rangecookers.co.uk) 2 years labour, upon registration. It is pretty sensible of Stoves to introduce two levels of spec, as not everyone will want to pay more for those extras they may not need. With Deluxe models you get pleasingly chunky Premium Shelves, a cast wok cradle (on gas or dual fuel models), a Steam & Infuse kit, Zeus Bluetooth connected timer (controlled via a smartphone app), Gas-thru-glass models and, on 90cm models, a ProFlex cavity splitter which turns the tall oven into two independent fanned ovens for very impressive flexibility when you need it. (three on non-Deluxe 90 models), with the grill cavity doubling as an oven on all, and a slow cook cavity on 100 and 110 models. Sterling ranges come in brushed Stainless Steel or a very handsome satin Black. Richmond is available in standard Classic Cream or Black, as well as special order Colour Boutique finishes on Deluxe models (including Anthracite on both core and Deluxe), for which you pay a small premium and may need to wait a few weeks. Normal delivery of in-stock models is typically within 7 to 10 days. Naturally Stoves also offer an excellent range of matching hoods and splashbacks, as well as some very nice freestanding refrigeration. With prices between around £1500 and £2500* the new Stoves collection resides where it should, at the top end of the mid-market alongside its main rival. To help things along there are some brilliant cashback and added-value promotions currently too (March 2019). With these very impressive specs, great looks and obvious high quality the Richmond and Sterling are real attention-grabbers which deserve all the accolades they have received from consumers and trade alike. 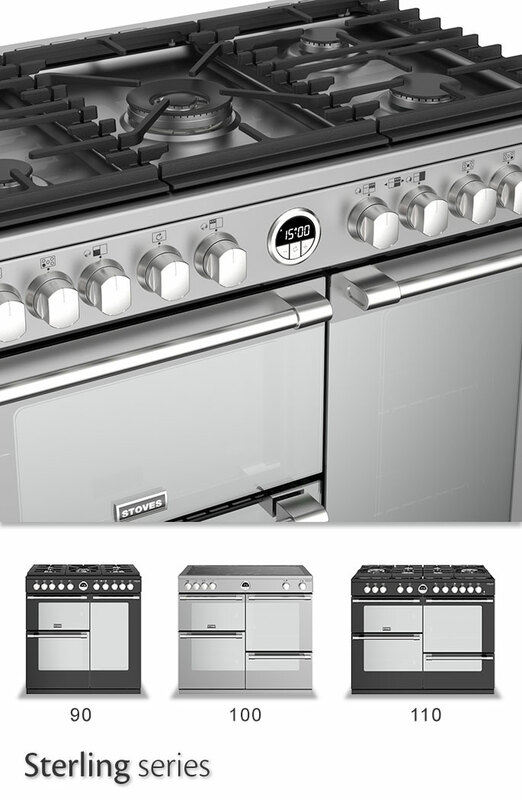 If you are in the market for a special range cooker we really do recommend you take a good look and judge for yourself.